Two Sided Pine Cone Mailbox Bracket & House Sign - - attaches to your own post. Made in USA. 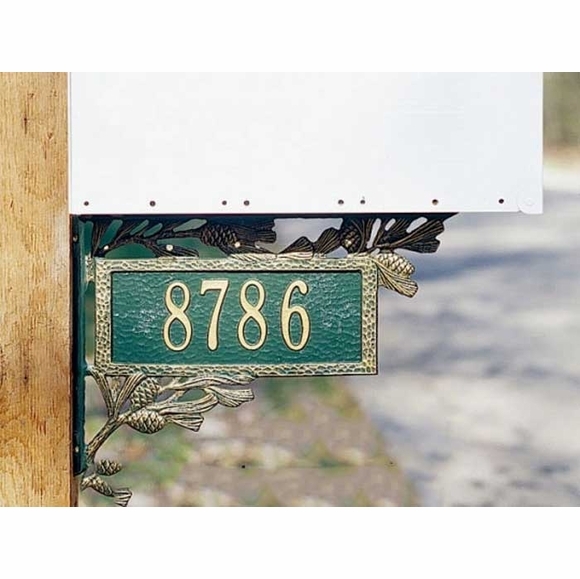 Cabin Lodge bracket not only accents your mailbox with a decorative design but also frames a custom made two side house number sign. Mounts to your mailbox post with two screws on the upper and lower end of the bracket. Post not included. Fits most curbside style mailboxes. Holds up to five (5) 3" characters or eight (8) 2" characters. Dimensions: 16.5" x 11.25" x 1.25". Colors: antique copper, black/gold, bronze/gold, green/gold.